Step 2: Add domain admin account. 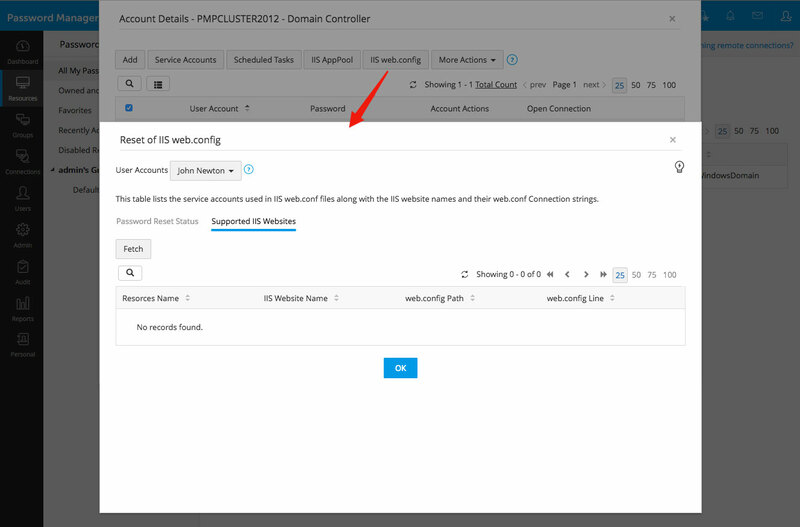 Step 3: Add domain member servers as new resources and create resource group. Step 4: Configure remote password reset for IIS web.config files. Step 5: Associate resource groups for the IIS web.config files. Step 6: Verify supported IIS websites. In the pop-up form that opens, add the Domain Controller - PMP Machine, as a new resource with 'Resource Type' as Windows Domain. Step 2: Add domain admin account and IIS websites. In the pop-up form that opens, add the domain administrator account (John Newton) and click "Add". Then, continue to add the accounts in the same way. When you are done, click "Save". In the pop-up form that opens, name the group and choose 'Match any of the following'. Step 4 - Configure remote password reset for IIS web.config files. Click the "Resource Actions" icon against the WindowsDomain 'PMP Machine' resource and select "Configure password reset" from the drop down. In the pop-up form that appears, select the 'Domain Admin' (John Newton) account as the 'Administrator Account'. Step 5 - Associate resource groups for the IIS web.config files. Click on the WindowsDomain 'PMP Machine' resource name. In the UI that opens, click the "Account Actions" icon against the app pool account (John Newton in this case) and then select "Edit account" from the drop down. Step 6 - Verify supported IIS websites. Click the WindowsDomain 'PMP Machine' resource name. Select the IIS website 'John Newton' and click the "IIS web.config" button. In the pop-up form that appears, click "Fetch" under "Supported IIS websites". Password Manager Pro will scan and list all the websites that are run in the servers of IIS websites in which the service account is used in the connection string of the web.conf files. After reviewing the list, hit 'OK'. Step 7 - Change password. Click the "Account Actions" icon against 'John newton' and then select "Change Password" from the drop down. Click "Save". Password Manager Pro will immediately reset the password in the domain first and then, automatically update the new password across all servers where 'John Newton' is used to run IIS websites. Additional steps to schedule periodic password resets for IIS websites. A resource group has to be first created. Click the "Actions" icon against the resource group and select "Periodic Password Reset" from the drop down. A pop-up form will open with a four step process through which required schedule can be created.